Not only do restaurants have a built-in catering clientele in their customer base, but they also have all the resources – food, equipment, staff- for catering potential big and small events. Restaurant catering offers you a chance to increase both your sales and your customer base. People already love your food, so why not capitalize on that and offer catering services as well? To get started, follow this quick guide to restaurant catering. Day-to-day operations of any restaurant require a tremendous amount of organizational skill. So does catering. You prepare and serve a large number of meals at one time, and orchestrate other aspects of the function, such as pouring champagne toasts, cake cutting and serving and overseeing the bar. Requiring a final headcount, setting firm time limits and requiring a minimum number of guests will ensure that you are making a profit on each catering job. The basics of restaurant catering include a breakdown of what equipment is needed to cater both large and small parties, how much staff is needed, the types of parties that restaurants typically cater as well as how to go about writing and planning catering menus. Both on-premise and off-premise catering have become increasingly common for many restaurants. Restaurants with private dining rooms and banquet facilities can increase sales by catering private parties and large functions such as weddings, holiday parties, and business conferences. Off-premise catering is another area of the restaurant industry that continues to grow. 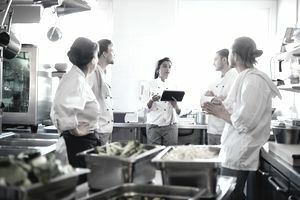 There are many questions about restaurant catering, including how to price a catering menu, whether or not to charge a room fee, and what kind of equipment is essential for catering. Restaurants have a distinct advantage over independent caterers, in that they already have most of the equipment needed for catering, such as plates, glasses, flatware, and serving utensils. It may be more economical to rent linens, if you don’t normally carry them, or if you don’t have enough on hand for both your regular dining room and your function room. By looking at planning an event at your restaurant, you can see where your strengths are (you’ve gotten A’s on all your health inspections) and where you need improvements (the function room desperately needs new carpet). If you got it, flaunt it! If you are lucky enough to have space for a private dining room or better yet, a large function room, it is only logical you try catering. It is a good way to boost sales, attract extra business, and is to improve word-of-mouth advertising.